The binding of clusterin to the JH facilitates BACE2-mediated β-cleavages. (A) APPWT (no tag) and BACE2 (Myc-His tagged) were expressed in HEK293 in the presence or absence (vector) of coexpressed clusterin (Myc-His tagged). CTFs were enriched by immunoprecipitation (IP) with C20 antibody, and blotted with 82E1 antibody specific for C99. 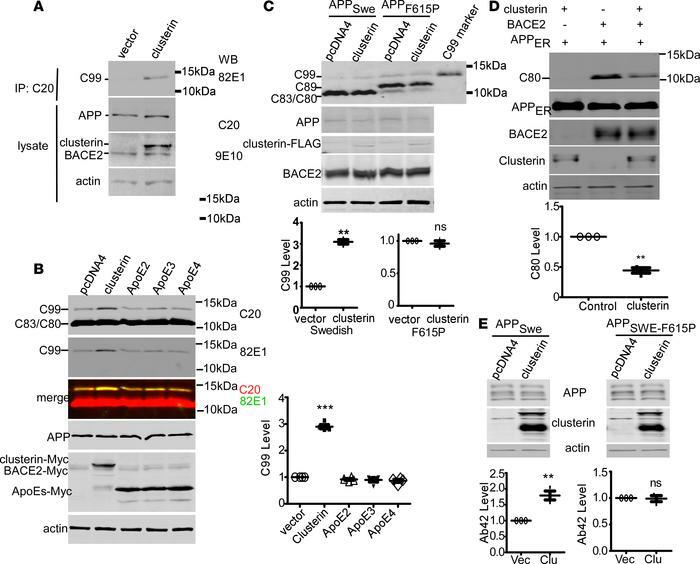 (B) Clusterin or ApoEs whose binding motif in Aβ resides in the JH region as well were overexpressed in 4EB2 cells, a HEK293 cell stably expressing human APP Swedish mutant (APPSwe) and BACE2. Total CTFs were blotted with C20 antibody and C99 was also blotted with 82E1. C99s were quantified (using C20 polyclonal) and expressed as the ratio to C99 in vector-expressing cells (n = 4 replicates). ***P < 0.001 (1-way ANOVA, Tukey’s post hoc test). (C) APPSwe or APPF615P were coexpressed with either pcDNA4 or clusterin-FLAG in 4B25 cells, a HEK293 cell line stably expressing Myc-tagged human BACE2. C99 levels were expressed as the ratio to C99 in pcDNA4-APP–expressing cells (n = 3 replicates). **P < 0.01 (paired t tests). (D) Nascent APP (APPER) and BACE2 were coexpressed with pcDNA4 (vector, clusterin “–”) or clusterin (clusterin “+”) in HEK293 cells. C80 bands were quantified and plotted as the ratio to C80 in vector-expressing (clusterin “–”) cells (n = 3 replicates). **P < 0.01 (paired t tests). (E) Clusterin was coexpressed in PC12 cells with APPSwe or the APP Swedish-F615P double mutant (APPSwe-F615P). Forty-eight hours after transfection, cell lysates were blotted for the indicated proteins and conditioned media were analyzed by Aβ1–42 ELISA. The amounts of Aβ1–42 were expressed as the ratio to Aβ1–42 from cells with pcDNA4 transfection (Vec) (n = 3 replicates). **P < 0.01 (paired t tests). All bars represent mean ± SEM.